Filed under: Art,Criticism, Marginalia, and Notes,Fun,Review,The Network Geek at Home — Posted by the Network Geek during the Hour of the Tiger which is terribly early in the morning or 5:35 am for you boring, normal people. Uh, the title says it all. Yeah, this is for all you digital SLR photographers out there. You know white balance can be a big thing. Especially when you’re doing a bunch of shots. So, any way to make it easier for your DSLR to auto-correct white balance is a good thing. Thanks to PhotoJoJo, you can get the white balance lens cap which helps you do just that. Seriously, I first saw this in a DVD tutorial on lighting techniques at my RitzU classes and I thought it was the slickest thing since sliced bread, but I haven’t been able to find one. Now, that’s been solved. Yea! Filed under: Career Archive,Geek Work,The Dark Side,Things to Read — Posted by the Network Geek during the Hour of the Tiger which is terribly early in the morning or 5:19 am for you boring, normal people. It’s vital to good server management to maintain a change control log. Really, it’s best for everything in an IT department to keep a good set of change control logs, but most of us don’t do it. Well, a great little blog called Ask The Admin has an article on the Importance of Change Management Record Keeping that is a “must read” for anyone who has to keep track of more than one system. Now, I have to admit, I don’t do a great job of maintaining documentation myself, but that’s not such a big deal since I’m a one-stop IT shop. However, if something should happen to me, it would make things better, and easier, for the next poor schmuck who has to take over. Mostly, when I get somewhere new, I’m confronted with a jungle of systems and armed with little more than a password. Sometimes, it’s not even the admin password. When I leave, though, I always try to leave behind updated, accurate, useful documentation. My desk may be a mess, but my documentation is at least usable. The first guy I used to work for always would ask me what I’d do if he were trapped under a rock. Check the documentation was often the first thing. So, I learned, whenever possible, leave good documentation for the next guy. Think of it as the Golden Rule of Documentation; Document for others what you would have them document for you. In any case, read the article. Then go forth and sin no more. Filed under: Advice from your Uncle Jim,By Bread Alone,Criticism, Marginalia, and Notes,Deep Thoughts,Life, the Universe, and Everything,Personal,The Network Geek at Home — Posted by the Network Geek during the Hour of the Tiger which is terribly early in the morning or 5:07 am for you boring, normal people. I bought a juicer this weekend. Specifically, I bought a Juiceman, Jr. It’s probably not the best one there is, but it was cheap, so I figured I didn’t have much to lose. I’ve been meaning to buy a juicer for a long time. Back when I was just about done with my chemotherapy, I ran into a lot of cancer survivors and they all seemed to have juicers. I lost count of how many times I was asked if I had gotten a juicer yet. I’d meant to, but just never got around to it. Well, after this past week, I decided it was finally time to stop obsessing over getting the “right” one and just get the cheapest one for now. I figured once I had some clue what I was doing and how much I was going to actually use it, then I could decide on a better machine. In the mean time, though, I figured that something was better than nothing. 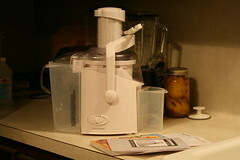 So, off I went this weekend to Target and I got myself the cheapest juicer they had. At $59.99, it was the Juiceman, Jr. Turns out, this was the machine endorsed by the “Juiceman” himself. That crazy, white-haired guy on the infomercials that started a lot of the most recent juicing craze. Turns out, he was a cancer survivor, too, and credits much of his health and recovery to juicing. Of course, I didn’t know all that when I first read about juicing or juicers. But, I know that I’ll ingest fewer calories with a higher nutritional content via fresh juice. And, since I’m sure I’m not getting my daily recommended servings of fruits and vegetables, I figured this might help with that, too. All I need to do now is figure out how to “juice” bacon! Seriously, the bottom line is that I need to improve my overall health and diet. I know dropping a few pounds will help in a lot of ways, but I need to be careful not to let my nutrition levels drop while I try to shed those pounds. Juicing seems like a good way to help make that happen. We’ll see, I guess, but either way, it’s time I started making more positive changes in my life. Filed under: Art,Fun,Red Herrings — Posted by the Network Geek during the Hour of the Tiger which is terribly early in the morning or 5:11 am for you boring, normal people. C’mon, it’s the perfect thing for a Friday; Tiltshift Maker. For those of you not familiar, “tiltshift” pictures take normal, large settings and make them seem like little, tiny diaoramas. In fact, there are very expensive lenses designed to get this very effect. But, why spend the money on that, when this website will do it for free? Anyway, it’s Friday and you certainly must deserve a little fun by now, so enjoy! Filed under: Fun,News and Current Events,Ooo, shiny...,Red Herrings,The Network Geek at Home — Posted by the Network Geek during the Hour of the Tiger which is terribly early in the morning or 5:20 am for you boring, normal people. Okay, this isn’t quite as cool as the Vulcan EBF-25, which was fully automatic, but the Nerf N-Strike Raider CS-35 is a close second. It’s a pump-action gun with a 35 dart drum magazine. Not fully automatic, but, then again, it doesn’t need batteries, either. If you follow the link you’ll get to a page with plenty of pictures and a short video of the Raider in action. What’s cool is that drum magazine. I’m not sure how they’d do it, based on the mechanisms but rumor has it that the drum magazine from the N-Strike Raider will fit the N-Strike Vulcan. Now that would be cool! Just imagine, not only would you have ten more shots, but no hassle loading up a belt, just snapping in a magazine. Well, we have a bit of a wait on this. It’s just been announce at a toy convention and I haven’t heard a word on when it will hit the streets. Filed under: Bavarian Death Cake of Love,Criticism, Marginalia, and Notes,Deep Thoughts,Life, the Universe, and Everything,News and Current Events,Red Herrings — Posted by the Network Geek during the Hour of the Horse which is around lunchtime or 12:19 pm for you boring, normal people. You celebrate it your way and I’ll celebrate it mine. Most people will be celebrating Saint Valentine’s Day today, but I think of this as Al Capone Day. It’s not that I’m not a romantic, because, truly, I am. It’s not that I’m a bitter, cynical, divorced guy who’s spent more holidays alone than with someone, though that is in part true. It’s not even because I’m a die-hard Chicagoan who’s found himself surrounded by Southerners who don’t really get him. No, it’s not any of those things. No, I “celebrate” this day this way because people forget how things really are. People forget that while the media giants force-feed us a slick, glossy idea of romance today, people are dying, struggling to make their lives work, and just trying to make it through. There are bigger things than romance going on. Some good, some bad. So, today, while most people will buy into the mass-produced saccharine romance of the holiday, I’ll remind people of the Saint Valentine’s Day Massacre. Today, in 1929, on the Near North Side of Chicago, Al Capone and several of his closest friends arranged for a deadly surprise. They lured several members of rival Bugs Moran’s gang into a local warehouse and garage, supposedly to make a deal for illegal whiskey, where hit-men, disguised as Chicago Police officers staged a fake raid. They then lined up the rival gang members and gunned them down. When neighbors saw them leave, taking some of their accomplices out in street clothes, they figured that Chicago’s finest were just on the job. It was actually quite clever and daring, in a sick sort of way. I’m sure there are just as many killings going on around the world today as there were then. Maybe more. All for about the same reasons. So, dress it up any way you want, but today is just like any other. And if you need a special day to celebrate romance in your relationship today… Well, good luck with that. Filed under: Advice from your Uncle Jim,Fun,Life, the Universe, and Everything,News and Current Events,Red Herrings — Posted by the Network Geek during the Hour of the Tiger which is terribly early in the morning or 5:02 am for you boring, normal people. Comments Off on Happy Lucky Friday! Filed under: Criticism, Marginalia, and Notes,Deep Thoughts,Life, the Universe, and Everything,Personal,Things to Read — Posted by the Network Geek during the Hour of the Dragon which is in the early morning or 8:09 am for you boring, normal people. Well, by the time most of you read this, I’ll be getting scanned at M. D. Anderson. Another CT scan, with barium contrast. And x-rays. I’m getting one every four months now, and then it’ll be every six and then once a year. Theoretically, it’ll be once a year forever, but I’m not sure if I can afford to do that forever, but I’m trying to take things one scan at a time. I try not to worry, but it does seem like I’m paying an endless series of medical bills and it does get to be a drain on my income. Naturally, I worry about what the results will be. I won’t know until Tuesday next week, so I’ll just have to hold on and hope for the best. The picture I’ve posted here includes that first x-ray from just under two years ago when I thought I had pneumonia. When my General Practitioner saw the film, well, I don’t think he’d ever told anyone they were going to die before. Oh, that’s not what he said, but that’s what his face said. The words he used were “unidentified mass”, but what I heard was cancer and death. As I recall, I started to cry in the exam room. But, obviously, that’s not what happened. I didn’t die. I went through chemo and came out a different person six months later. I’m not quite the same guy I was when I came down with a slight case of cancer. I’m not entirely sure how I am different, really, but I know I am. I can feel the difference. This weekend, I was talking with someone about a book. It was a book that had been recommended. It had been offered as a guide to finding God, or at least an aid. My response was that I didn’t know much about spirituality, really, but I spent a lot of time reading books about it and I never once found God in a book. Books are about knowing things in my head, understanding, an intellectual knowledge. But, God and spirituality is something I need to feel. Those are things that knowing in my head hasn’t been of any real benefit to me. They’re things that I have to experience, to feel. A friend of mine tells me that I’ve gained some spiritual knowledge from my ordeal. Some new, deeper truth about life, my life, that I have yet to integrate into my world. He seems to think that’s why I get uneasy and restless more often than used to. He’s more spiritual than I am, so maybe he’s right. I don’t know. I do know that while I spend a lot of time talking at God, I don’t spend a lot of time listening. For all I know, God’s been answering me quite directly for some time now, but my mind is too filled with chatter and mental junk that I can’t hear Him. So, what to do. Well, I don’t know, really, but old habits die hard, so I’m reading a book on meditation. Specifically, A Practical Guide to Buddhist Meditation by Paramananda. My thought is that it will help me still my mind and clear the way for something better to come into me. When I used to meditate, back in college, it used to really relax me and calm me down. But, it’s been so long, I thought I could use a refresher course in how to do it. Besides, it was on sale. I can’t hardly resist a book sale. Who knows? Maybe next time, I won’t get so worked up about getting the radioactive enema from a stranger. Wouldn’t count on it, though. Filed under: Calamity, Cataclysm, and Catastrophe,Deep Thoughts,Geek Work,Life, the Universe, and Everything,News and Current Events — Posted by the Network Geek during the Hour of the Monkey which is in the late afternoon or 5:32 pm for you boring, normal people. I haven’t heard much in the US news about the fires in Victoria, but I know it’s bad. I know people down there, though, thankfully, none of them seem to be effected by the bushfires. Still, a lot of people are and the death toll has topped 200. But, I won’t dwell on how bad it is. Instead, I’d rather point out some folks trying to help. This is mainly for the techies and comes to me via ProBlogger. SitePoint, who publishes really interesting web design books, among other things, has their headquarters in Melbourne, the capital city of Victoria. In their effort to help out their neighbors, they’ve got a special deal going on their eBooks. Now, through Friday, Australian time, SitePoint is offering five books of your choice for the price of one, in PDF format. The proceeds of this will all go to help the Australian Red Cross Victoria Brushfire Appeal. It’s a worthy cause and you get some great books out of the deal, too. So, if you’ve got the cash, it’d be a great way to help out. Just thought I’d let folks know.